Nature of Biology 1 5E VCE Units 1 and 2 eGuidePLUS (Online Purchase) provides teachers with online support through instant access to student and teacher texts plus a complementary set of extensive, customisable assessment (including SACs) and curriculum materials to make teacher planning and preparation easier. • Complete, in-depth coverage of the new VCE study design for 2016-2021. • The theory is written by highly experienced and successful authors with a proven and fundamental understanding of how students learn and succeed in exams. • Quick check revision questions throughout the chapter check and challenge students’ understanding. • A wide range of graded end-of-chapter questions including a Biochallenge section. 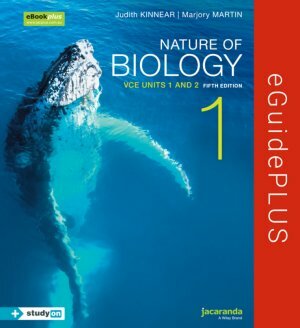 • studyON VCE Biology Units 1 and 2 is fully integrated with the student text. studyON is Jacaranda’s unique study, revision and exam preparation tool. Area of study 1: How do organisms function? Area of study 2: How do living systems sustain life? Area of study 1: How does reproduction maintain the continuity of life? Area of study 2: How is inheritance explained?